You may click on the links below to skip to the feature you are interested in. Fueled by 21st Century information technology, the world has become an extremely volatile place. As the aftershocks from the Arab Spring roll out across the globe, political and cultural conflicts play out in sudden violence. Against the incendiary backdrop of societies in spontaneous, often bloody transformation, civic buildings become places of refuge, and targets in themselves--something the U.S. Department of State has known and confronted for most of the last 50 years. All the more reason to appreciate the latest initiative that is shaking up business as usual in the halls of the State Department’s Bureau of Overseas Buildings Operations, locally known as OBO:nothing less than an all-out commitment to Design Excellence. It may be this last point that has inspired change at OBO: the previous decade of Standard Embassy Design led inevitably, if not intentionally, to a kind of style--a highly repetitive series of austere facilities, in which the heavy hand of physical security was often the dominant impression. Make no mistake, security is still ‘job one’ at OBO, and just one look at the recent photographs of mob violence in Sanaa is enough to make the case: however welcoming we want them to appear, our diplomatic centers overseas must be very good at keeping people out. Reconciling the need for fortification with high aspiration for other qualities--sustainability and building performance, the representation of open democracy, the integration of art and architecture, to name a few--is clearly a more extreme challenge for overseas buildings, compared, say, to the GSA’s domestic program. Leading the change, Director Lydia Muniz spent an entire year tracking the process through OBO’s many disciplines, and now Director of Design Excellence Casey Jones--on loan from GSA--has joined the team, kicking off a renewed approach to design review with an expanded assembly of peer professionals. The new emphasis on Excellence recognizes the critical role embassy buildings play in terms of cultural diplomacy, and the implicit statement of American values that is inevitably presented by our overseas buildings. The opportunity for architects is clear, as Jones recently confirmed in a presentation to the Southern California Institute of Architecture in Los Angeles: “For many people around the world, our embassies are the only examples of American architecture they will ever experience.” Designing an embassy is now at the top of the list for many aspiring firms. While the new program is sure to be transformative, design excellence in itself is not new at OBO. Major design competitions for new embassies in Berlin, Beijing, and London have attracted contemporary American leaders in the profession. Moore Ruble Yudell’s own 17-year collaboration with the Bureau--currently through an IDIQ contract--has yielded some of our most satisfying civic work, with a completed embassy in Berlin and some 6 other projects now in design and/or construction. In terms of representing values, our own design priorities highlight the unique civic context of the embassy as a place where two (or more) cultures come together: How does the design of a U.S. diplomatic campus honor its host country setting, and heighten the experience of place for American foreign service professionals as they rotate from country to country? Two examples--both now under construction by design-build contractors--demonstrate that strict standards needn’t result in standardization. In Santo Domingo a large program is sited in a newly developing area of the city, far from its famous historic core.The design evolved largely in response to climate--windows and outdoor plazas are continuously shaded with broad canopies and deeply projecting walls. The unapologetically bold expression draws inspiration from Latin-American modernism--in particular at the central atrium where sweeping curves of white wall arc around and up to clerestory windows. The space will provide a dynamic setting for a site-specific mobile sculpture to be designed by the artist Pae White. In Helsinki, new high-security spaces--mostly without windows--had to be inserted into a complex setting of heritage buildings and neighborhood, on a prominently visible site looking out over the Gulf of Finland. Here too climate was significant, as well as the profound cultural context of modern architecture and design in Finland. The new wing is attached to a remodeled 1926 apartment house, the Annex, and had to fit into a tightly circumscribed footprint, as determined by security requirements--an exercise we called ‘form follows setback’. But we welcomed the fish-shaped plan that resulted, as a form complementary to the historic neighbors, a contrast that is accentuated by materiality. The curved walls are rendered in vertically textured warm white brick toward the street, and a spectrum of textured glass surfaces facing the waterfront, reflecting the often icy context of the Gulf, as well as Finland’s famed modern glass craft. While recognizing cultural significance, OBO’s definition of Design Excellence is equally strong on building performance and sustainability. Santo Domingo is among the first with a LEED Silver requirement, and the remodeled 1926 Annex in Helsinki is targeted for LEED Platinum. The new program has taken the Bureau’s interest in workplace innovation to a new level, leading to more efficient, more flexible high-performance interiors. Our projects with OBO have challenged us to thoughtfully translate heightened standards of security into an architecture that optimistically celebrates the unique virtues of locality. We hope the resulting work provides a meaningful preview of what can be accomplished now that the State Department, in the face of even greater world uncertainty, has bravely chosen to double-down on Design Excellence. The AIA California Chapter recognized our competition winning Master Plan for the new Chinese Academy of Sciences, Shanghai campus with a Merit Award for Urban Design. The Grangegorman Masterplan is a recipient of the Society for College and University Planning (SCUP) Honor Award in SCUP's 2012 Excellence Awards Program. The Ruddell Residence is recognized by the AIA Honolulu in the category of design excellence. Juror comments highlighted the extent to which climate consistently played a central role in the building’s shape and function. Having gained local planning approvals, the next steps for the implementation of the new campus Master Plan are being undertaken leading to a ground breaking anticipated for December 2012. Following an international design competition, Moore Ruble Yudell has been awarded the Fire Services Training School (FSTS) in Tseung Kwan O, New Territories, Hong Kong. This is in collaboration with Local Executive Architects ALKF and the Design-Build Contractor, China State. Moore Ruble Yudell has been awarded Phase 1 of the COFCO Agricultural Eco Valley Master Plan. The program includes a world-class winery and resort hotel facility. Moore Ruble Yudell is proud to announce our first project on the African continent, a new U.S. Embassy in N'Djamena, Chad. Design on the 12 acre, 7 building campus is scheduled to be complete in May 2014. Moore Ruble Yudell has been selected by the top-ranked Brown School of Social Work at Washington University in St. Louis to design their new expansion. The building will consolidate the Brown School on the Danforth Campus, foster interaction, sustainability, and wellness, qualities which reflect the progressive spirit of the Brown School. Construction is underway at the Washington University in St. Louis' Olin Business School. This is a 175,000 square foot, $90 million expansion project that will nearly double the size of the business school. A Topping Out Ceremony was held on October 21, 2012, for the Henry W. Bloch Executive Hall for Entrepreneurship and Innovation. 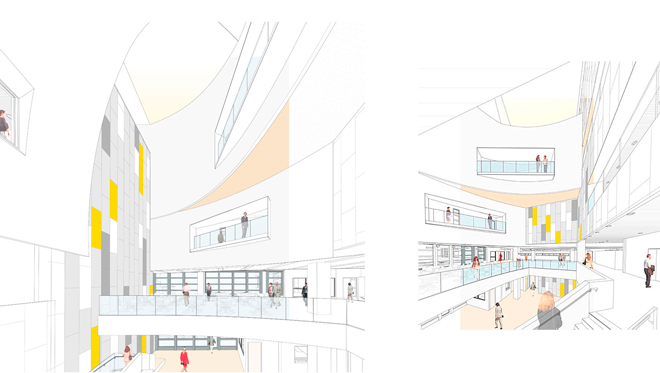 Moore Ruble Yudell and BNIM have worked in collaboration to design spaces which support the school's vision and mission and enable creativity and design-led innovation. The building is scheduled to open in the fall of 2013. The two tower classroom and student center, Two Integrated Teaching Building, opened with great success for the beginning of fall classes on the Chinese University of Hong Kong’s campus. Moore Ruble Yudell celebrates the completion of the Claremont McKenna College North Mall landscape. The master plan improvements transform the campus center with a new fountain, outdoor classrooms, expanded seating areas, drought-tolerant planting, and universal access. Principal James Mary O'Connor presents at the AIA LA office. His presentation focuses on selected, relevant residential projects that are located on different sites and regions around the world. They provide diverse design approaches while addressing a variety of urban contexts and residential building typologies. A symposium on the design of Charles Moore's seminal 1968 landmark will be held at UCSB on December 1, 2012. Moore Ruble Yudell is currently in design on the Faculty Club's expansion and renovation. Partner Buzz Yudell joined architects of the University of Cincinnati's distinguished building program for a symposium focusing on campus planning and design. Included in the panel were Michael Graves, Peter Eisenman, Thom Mayne, Jane Weinzapfel, and Andrea P. Leer. Principal James Mary O'Connor delivered presentations on two projects that have been recognized as WAF Award Finalists: the net-zero-carbon COFCO Agricultural Eco Valley project in China (in the category Future Projects—Experimental), and the United States Embassy, Helsinki, Finland (in the category Future Projects—Mixed Use). Principal Mario Violich serves as a juror for the Pasadena & Foothill Chapter AIA (AIAPF) Design Awards. The forum celebrates design excellence and innovation in the region. The chapter is widely recognized for fostering an appreciation for design excellence in the community. Partner Buzz Yudell participated in a panel Marketing Methods: Expressing Your Practice, Expanding Your Reach for the USC Architecure XED program. The panel was led by Julie Taylor, Honorary AIA LA and Barbara Casey. Included in the panel were Christoph Korner, Graft, Julie Smith-Clementi, Rios Clementi Hale Studios and Scott Kelsey, CO Architects amongst others. Partner Buzz Yudell moderated and participated in a distinguished panel at the June 2012 meeting of the Association of University Architects (AUA). The panel focused on contemporary challenges of campus planning and urbanism. Michael Maltzan, Stefanos Polyzoides and Kevin Daly provided a diverse and provocative array of persecptives.